The mystery of why the bubbles in the legendary beer Guinness sink as opposed to rise as one might expect has finally been solved — the secret apparently lies in the shape of the pint glasses from which Guinness is often sipped, researchers in Ireland say. 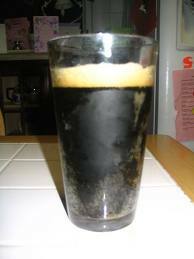 After one pours a glass of the famous Irish stout Guinness, the white bubbles settle downward. Since bubbles are lighter than beer, one might think this defies the laws of gravity. “In one’s everyday life, one rarely comes across such a counterintuitive phenomenon, challenging equally the imagination of a university professor as well as that of Bill, John and Harry from the local pub,” said researcher Eugene Benilov, an applied mathematician at the University of Limerick in Ireland.